Who's that odd ant out? While in sunny Florida last summer (ah, sunshine! I vaguely remember what that looks like), I spent an hour peering into a nest of little Dorymyrmex elegans. These slender, graceful ants are among Florida’s more charming insects. Every few minutes, though, the flow of elegant orange insects out of the nest was interrupted by a darker, more robust ant: Dorymyrmex reginicula. Who was this interloper? The Archbold Biological Station hosts 100+ species of ants. Here are a few of them. As if butterflies weren’t flamboyant enough already, it seems that some of them actively impersonate queens. Ants dominate terrestrial ecosystems through living in complex societies whose organization is maintained via sophisticated communication systems. The role of acoustics in information exchange may be underestimated. We show that Myrmica schencki queens generate distinctive sounds that elicit increased benevolent responses from workers, reinforcing their supreme social status. 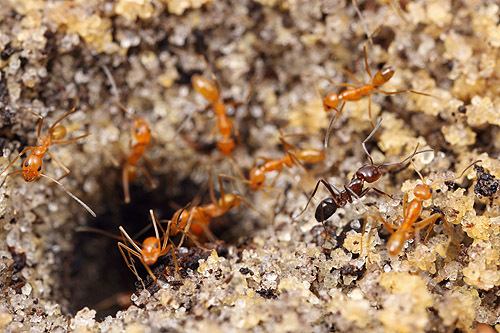 Although fiercely defended by workers, ant societies are infiltrated by specialist insects that exploit their resources. Sounds produced by pupae and larvae of the parasitic butterfly Maculinea rebeli mimic those of queen ants more closely than those of workers, enabling them to achieve high status within ant societies. We conclude that acoustical mimicry provides another route for infiltration for ~10,000 species of social parasites that cheat ant societies. Sounds of the ants and the butterfly are posted at Science News. See also commetary by Discover and Not Exactly Rocket Science. source: Barbero, F. and J.A. Thomas, S. Bonelli, E. Balletto, K. Schönrogge. 2009. Queen ants make distinctive sounds that are mimicked by a butterfly social parasite. Science 323(Feburary 6): 782-785. Must we call them meat ants? The blue-green iridescence on these Iridomyrmex purpureus workers shines from microscopic sculpturing on the ants' cuticle. I’ve never taken to the Australian vernacular for one of their most conspicuous insects. The latin Iridomyrmex purpureus translates as “purple rainbow ant”, referring both to the base color of the body and to the attractive metallic refractions on the cuticle. But Aussies instead call this colorful species the “meat ant.” Crass by comparison. On the other hand, it’d probably not do my reputation of masculine bravado much good were I to stroll into a dusty pub in the outback and announce my affection for “purple rainbow ants.” Crikey! Meat ants it is, then.